Our participation projects are a chance for local people from all backgrounds to engage more deeply with our talented and adventurous artists. Our projects take place on and off site and with a range of industry partners. This work is intended to offer in depth and meaningful introductions for new audiences to visionary artistic practice. Some examples of past participatory projects are outlined below, as well as current activity. 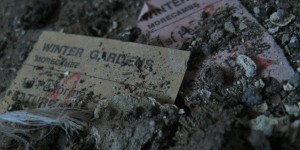 What tales can you tell about the Morecambe Winter Gardens? Artists Raisin & Willow are collecting stories as research for Sea Breeze, a performance about the life of the Winter Gardens. Rajni Shah Projects' large-scale musical piece Glorious was realised here in December 2012. Live at LICA supported artists Invisible Flock worked for a year to create Sand Pilot, a walking performance across the sands of Morecambe Bay in September 2012, led by the last Queen’s guide to the Sands, Cedric Robinson. Green and her company deliver relentless, raw energy in this thrilling new art-work designed to challenge, inspire and make way for positive change. A sound-based installation by Renny O’Shea (of theatre/research company Quarantine), made with and about currently-serving British soldiers and taking the form of an intimate karaoke booth. This site-specific performance will be performed with a group of 30 local female co-performers, playing the roles of Mem’s potential wives and wedding guests. (it's going to be) Glorious! What if the city of Lancaster suddenly vanished? Disappeared? What memories would remain? What stories would we tell? A collaboration between Nuffield Theatre associate artist and director Neil Callaghan, and a group from the Dukes Youth Theatre. Our award-winning project saw artists and local residents from Lancaster and Morecambe programme the Nuffield Theatre for one year in 2007-08. Morecambe Dances is a short film devised by a team of artists led by Jenny McCabe, Vicky Van Mechelen and Helen Bendon. In D'aprиs J C (According to J C), Herman Diephuis creates an icon-filled Renaissance art gallery in motion. A promenade theatre piece on the prom in Morecambe, made by choreographer Niki McCretton, compser/filmmaker Kathy Hinde, and local grandparents and grandchildren. The Postcards to Africa Project provides young people from Lancaster and Morecambe the opportunity to get involved in a professional event led by The Dukes, with the Nuffield Theatre & Ludus Dance.